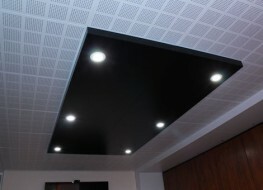 Utilising our standard 120 m PVC or 55 m PET coated mild steel material for the ceiling tile and perimeter channel, the MIDDAS MCT suspended ceiling system allows us to perfectly match our ceiling and wall finishes. 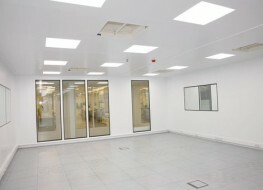 Using a proprietary spring-T, suspended from our in-house-developed supporting structure, MIDDAS can provide bespoke solutions using lattice beams and support frames, tailored to suit the site requirements and accommodate numerous scenarios where traditional suspension methods are restricted or prohibitive. 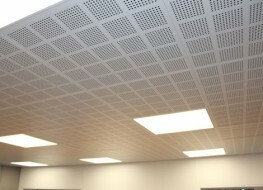 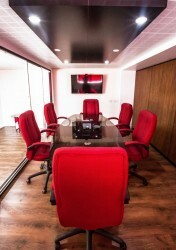 With options to factory form cut-outs for small service requirements and an alternative acoustic absorption tile to reduce sound reverberation, the MIDDAS MCT suspended ceiling system provides a multitude of solutions for Controlled-environment, Healthcare, Commercial and Industrial sectors when a cost effective, flexible, adaptable, rapid-build and fully demountable ceiling system is required. 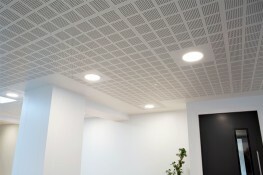 Please note that these product properties are not a replacement for the manufacturer's literature and it is always recommended that MIDDAS is consulted before specifying.